The A4 is Audi's best seller, appealing to families and business users alike with a blend of prestige image, spacious interior and good driving manners. 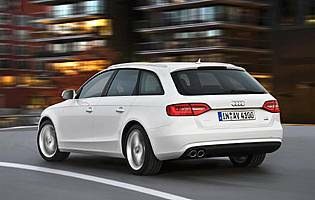 Many are bought as company cars and spend the first few years of their lives covering long distances, but the A4 has always been equally adept at carrying families and their associated luggage. 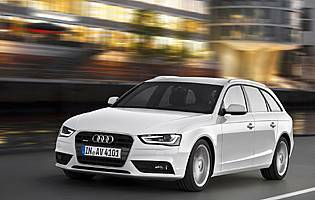 Audi's compact executive cars have been sales winners for the firm for 40 years. The 2012 model is not all-new, being instead a restyled version of the previous car, with new engine technology as well. It's targeted at the business user market and features much improved fuel economy and CO2 emissions to reduce ownership costs. The styling has been sharpened, replacing the blocky shapes of the old model with a sleeker, prettier nose. The silhouette is still much the same, though. New engines offer a better mix of fuel efficiency and performance, with a good choice of petrol and diesel options. The diesels in particular have been worked on to make them smoother and quieter. The Avant is the estate version of the A4, and is blessed with arguably more balanced proportions than the saloon as well as a slightly bigger and more practical boot. It's aimed more at families than the saloon is, and although sales of both body styles are biased towards the Avant in continental Europe, the British buy more saloons. Trim levels have continued largely unchanged from the previous model, and will be familiar to anyone upgrading or replacing their old A4. Many diesel A4 saloons are initially used as company cars, but the Avant tends to be bought privately for social and domestic use, which can mean they have covered fewer miles and retain more value. 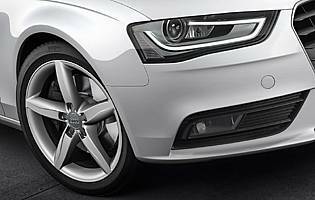 The design of this A4 is tried and tested, and with many improvements having been made to efficiency and running costs. It's a known quantity, but better in ways that can't be doubted. It cruises quietly, boasts economical engines and feels well made. It faces stiff competition but represents a good option for people who prioritise refinement over sporting pretentions.